The Little Angel Theatre (puppets) have an interactive new take on Punch and Judy aimed at ages 3-9. The show is called Little Angel by the Sea and is on until 5th Aug at Sebbon Street Community Centre, N1 2EH. Full details here. Also for those aged 3+ is a show called Monstersaurus! on in the Queen Elizabeth Hall (Southbank Centre). They say: “This energetic show is full of thrills, spills, magic and mayhem. With original music and plenty of audience participation, this is a treat for the whole family.” The shows run from 7-12th Aug. Details. “…one of the biggest South Asian festivals in East London, showcasing traditional and modern music, dance, fusion fashion, kabaddi and a range of arts and crafts.” This free event is on at Chestnuts Field, Waltham Forest Town Hall from 2-8pm. Details. Mile End Old Town Residents’ Association have a detailed article on the traffic calming plans for Harley Grove, following 5 crashes last year. Details on the MEOTRA website. Is social club for people with dementia, their families and carers, usually held on the first Thursday of each month between 11:00am – 1:00pm. The next one is on 2nd Aug at The Community Hall, 32 Merchant Street, Bow E3 4PZ. If you’re into photography or art, the (generously funded) Barbican Library is the place for you. It has an huge quantity of oversized expensive books. You don’t need to live or work in the City, just turn up with your ID to join. Liverpool Street is just 2 stops from Mile End on the Central Line. You can renew online. It’s easy to get blasé living in London. Today I came back with a bag of 4 books weighing 6.2 kilos and worth about £90. I took a chance on a book called George Grosz – the Berlin Years. He was painting and drawing satirical cartoons after the end of WW1. Until I started reading it I had no idea that he and his friends were in and out of court for “distribution of obscene works”. They were also printing banned magazines and distributing them before the police could seize them. 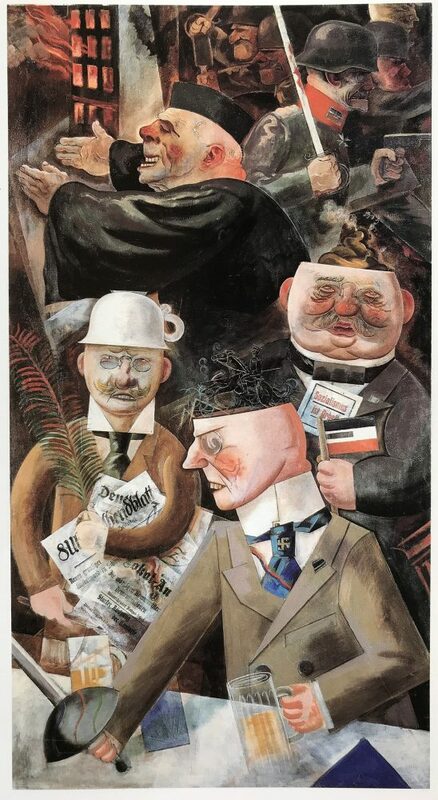 Grosz was painting and drawing recognisable people: politicians, gangsters and industrialists together and with prostitutes. In the painting below the war monger in the foreground has fencing scars, the chamberpot on the journalists head is there to show that he has clean thoughts, and the war raging in the background is a warning about Hitler. The Newham Recorder reports that two trials have taken place so far. Police are scanning faces looking for known suspects. So far so sensible, you might think, but would you trust our Home Office? I also found this article in Der Spiegel (it’s in English).